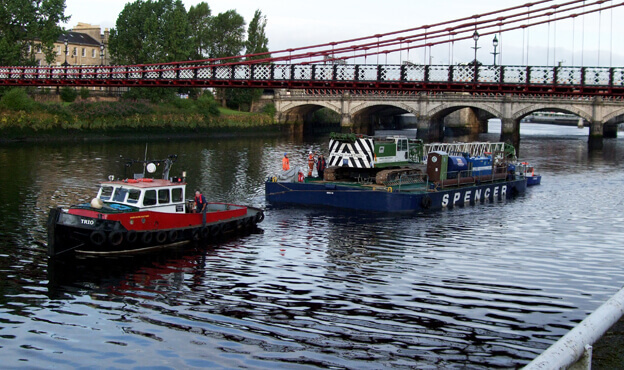 Spencer Group were appointed to design and construct a new learning centre on the River Clyde. 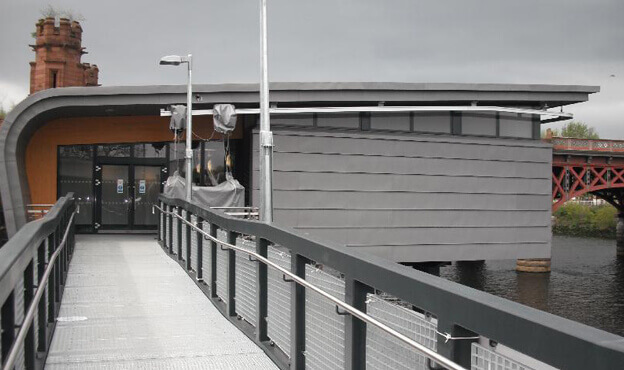 The Marine Skills Centre project created a world class teaching facility beside the Albert Bridge for students and staff, on behalf of Glasgow College of Nautical Studies. The project involved a number of key disciplines including design, piling and construction work within a marine environment. Spencer Group were responsible for the design and construction of a one storey 450m2 facility positioned on steel piles, raised above the River Clyde. Glulam columns and beams with a zinc cladding roof were used to form three classrooms, changing rooms and office space. A new lifeboat launch was also constructed in the river, connected to the existing boathouse by a brow walkway accessing a new pontoon. We were also required to refurbish the existing boathouse, and create a 43m long steel link walkway to provide access between the buildings. The project required significant marine piling, with H piles and 10 No. tubular piles used to support the learning centre, in addition to 12 no. piles for the walkway, lifeboat launch structure and floating pontoon. 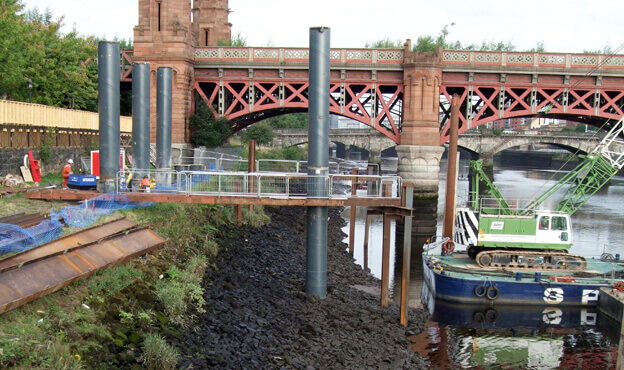 Through close coordination with local stakeholders including the Environmental Protection Group, Marine Scotland and the client, we were successfully able to carry out marine piling works and the construction of steel frames, by using water barges and cranes, without disturbing Atlantic Salmon, Lamprey and Otter. This was achieved by only piling and carrying out noisy construction methods in specified safe areas under the EPG and SEPA instruction and avoiding these works during migration periods. Spencer Group were therefore awarded a BREEAM Excellent status for our design and construction activities to minimise the adverse effects of new buildings on the environment.